Kids grow faster than our budgets! That's why we savvy parents enjoy shopping at Just Between Friends! At our 4 day spring sale you will find gently used baby, children's and maternity items from over 400 families all under one roof! Savvy parents will find spring and summer clothing, shoes and rain boots, maternity clothing, baby equipment, furniture and gear, books, games, puzzles, summer sporting goods, arts and crafts, dvd's, electronics and toys, toys, toys! Don't miss this event! 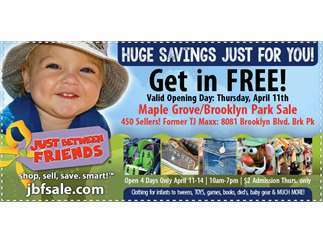 JBF Maple Grove spring sale, April 11-14, 2019.